Surf, sun, concerts and plenty of adrenaline will be on-hand at this event that takes place in San Pancho, Nayarit on July 21, 22 and 23; there will be $100 thousand pesos in prizes. The beautiful beaches of the Riviera Nayarit host the 2017 NIIJIMA San Pancho Mexican Surf Open from July 21-23, with $100 thousand pesos in prizes. 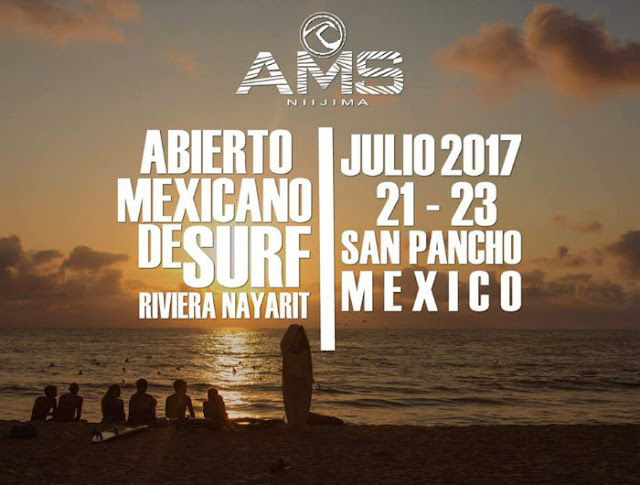 The 2017 NIIJIMA AMS, presented by the Riviera Nayarit, is a competition organized almost entirely by Mexicans and is open to any age and nationality; it has the backing of the Nayarit State Surfing Association and is endorsed by the Mexican Surfing Federation. According to Marco Carrillo, GM of the event, while the competition is happening at the main beach in San Francisco, Nayarit (San Pancho), there will be activities for the entire family onshore including volleyball tournaments, beer pong, mechanical surf boards, concerts, DJs and an eco-program. The musical program is headlined by Casimiro Zamudio’s Mi Banda El Mexicano; Rubél Albarrán DJ Set (Café Tacvba), Los Vikingos del Norte, Los Minions, DJ Bola Pirata and DJ Funky Kong, among others. Carrillo added that all the activities are free as it’s an event for the Mexican people so they can better know this sport on a national level. Some of the confirmed participants include Diego Cadena, Blas Bocardo, Dylan Southwork, Adán Hernández, Yuco, Angelo Loano, Leila Takeda, Regina Pioli, Jimena Ochoa, Ceci González and Pamel Verboonen, among others. Mexicans and foreigners, professionals and amateurs: all surfers are invited to this competition. The categories include: Men’s Open, Women’s Open and City Boys (Amateur), all on short boards. There will be $100 thousand pesos available in prize money for the winners of the Open Categories (men’s and women’s), while the Amateur category winners will receive products from sponsors. The event begins on Thursday, July 20th at 7 p.m. with an opening ceremony that will include elements of the Wixárica culture. From 8 p.m. to 9 p.m. there will be a Heats Surf raffle, a judges’ meeting and an acknowledgment given to the Mexican team that competed in the French World Surf Open. The welcome cocktail will be held from 10 p.m. onward. The competition will begin on Friday the 21st and will end on Sunday July 23rd. The awards ceremony is programed for 9 p.m. that evening.